A college degree may up your chances of earning more money, but you don’t necessarily need one to be happy at work. 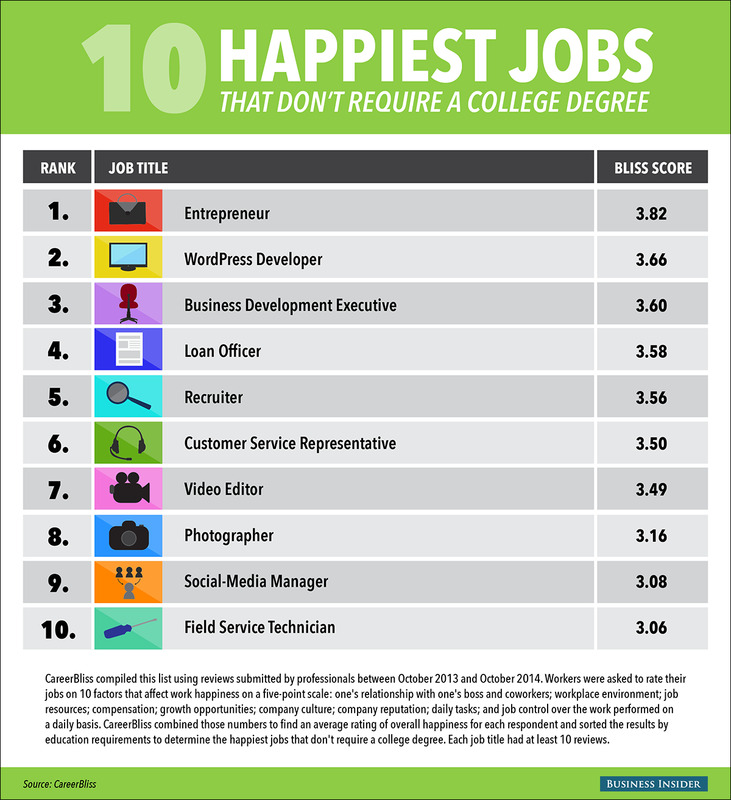 Business Insider teamed up with careers site CareerBliss.com to find the 10 happiest jobs that don’t require a four-year degree. CareerBliss compiled the list using reviews submitted by professionals between October 2013 and October 2014. Workers who reviewed their jobs were asked to rate them on 10 factors that affect work happiness on a five-point scale: relationship with their boss; relationship with their coworkers; workplace environment; job resources; compensation; growth opportunities; company culture; company reputation; daily tasks; and job control over the work performed on a daily basis. CareerBliss combined those numbers to find an average rating of overall happiness for each job — called a bliss score — and sorted the results by education requirements to determine the happiest jobs that don’t require a college degree. Interestingly, entreprenuer came out on top.